Does India Really Need A Stealth Fighter? On July 30, the U.S. Department of Commerce announced "India’s status as a Major Defence Partner will allow it to receive more U.S. high technology and military items without individual export licenses. India will be moved into Tier 1 of the Department of Commerce’s Strategic Trade Authorisation (STA) license exception". This was followed by reports of USA's intention to sell armed Unmanned Combat Aerial Vehicles (UCAV’') in the preceding month. The STA-1 status is thus likely to facilitate this potential acquisition. Additionally, on April 20, IHS Jane’s in its Defense Weekly reported of India withdrawing from the joint venture with Russia for the development of the Sukhoi Su-57, a fifth-generation stealth fighter, after almost 11 years of collaborative programme failing to make significant progress. This also led to Russia announcing the limited production of the Sukhoi Su-57 citing lack of operational and strategic requirements and potency of the existing fleet. Given that India has consistently been one of the largest importers of defense equipment across the globe, it becomes significant to understand the basic rationale for India's contemporary need for a fifth-generation fighter aircraft in the backdrop of available alternatives. Factors such as the emerging threat perception, operational and economic challenges, the available alternatives, and counter measures will be taken into consideration to analyze the very decision for the development or procurement of a fifth-generation fighter aircraft. Why Do Nations Typically Need Stealth Capabilities? As on date, the U.S. has been at the forefront of the development and deployment of stealth technologies. While the research and development costs, as well as the ensuing operational costs of these state of the art systems like the B2 Spirit bomber, F-22 Raptor, and the F-35 Joint Strike Fighter, are substantial, the nature of adversaries and overseas engagements necessitates the use of such capabilities. With Russia and China increasingly attempting ascension in the global arena, additional development in the technology has been witnessed in recent years. For instance, China has claimed major successes in the development of its indigenous stealth aircraft, Chengdu J-20 and Russia has been engaged in the advancement of the Sukhoi Su-57, albeit with limited success. In the case of India, the strategic sphere of interest has primarily encompassed the region between the Persian Gulf to the Malacca Strait. Moreover, with a history of a non-confrontational foreign policy and lack of any overseas military engagement outside the United Nations (UN) mandate, the very rationale of procuring aerial assets with stealth features is debatable. The critical requirement thus lies in the national security domain and not overseas military muscle flexing. Keeping the inventory in mind, the Indian Air Force (IAF) is considered to be one of the best-trained services in the region. In terms of equipment, the expected force strength level of around 42 squadrons has been estimated in case of a contingency featuring a two-front war against India’s neighbouring adversaries — Pakistan and China. However, the current squadron strength of 33 points toward a conspicuous disparity between the ideal strength and the existing capabilities. Availability of spares for the existing Jaguar and Mirage-2000 fleet being a narrative in itself. This can primarily be attributed to the critical delays and/or failure of the indigenous defence-industrial complex to meet the demands of the armed forces over the preceding decades. This has resulted in the Indian government floating tenders for mega defence deals like the one for 126 multi-role aircraft. However, given the size and scale of the project and the near lack of economic feasibility, coupled with India’s complex defence procurement policy, the project was indefinitely postponed and paved the way for procurement of 36 French Dassault Rafale in fly-away condition. The delays and cost overruns in the development and fielding of the indigenous Tejas also adds to the IAF’s woes resulting in the IAF taking charge of the production and development of the project from the Hindustan Aeronautics Limited (HAL) as announced on August 4. 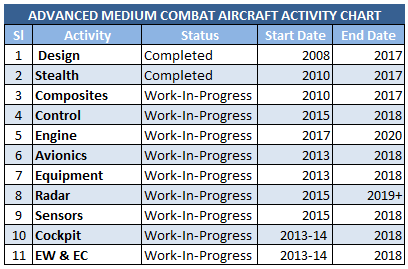 However, HAL is still holding its ground by working on country's next fighter program — Advanced Medium Combat Aircraft (AMCA) — a single-seat, twin-engine, canted twin-tail configuration, a stealthy all-weather multi-role jet fighter. Feasibility study on AMCA and the preliminary design stage have been completed. But, the project awaits approval to begin airframe design, development, and finalisation stage as the domestically manufactured Kaveri engine (an upgraded GTRE GTX-35VS Kaveri 90 kN in partnership with French engine-maker Snecma) is still going through developmental phases at the Gas Turbine Research Establishment (GTRE) in Bangalore. It has been speculated, the first flight is scheduled to occur in the year 2025 with an advanced derivative of Kaveri engines. Additionally, taking into consideration the economics of developing and deploying the stealth assets, coupled with the acute gaps in the allocated budget and the expected force capabilities, the induction of these stealth-capable fighter aircraft is a costly proposition. Investing the same resources in upgrading the existing inventory or undertaking procurement that can help minimise the existing shortcomings in the force levels remains a more prudent choice. Speaking in terms of conventional military threats and given precedence of the nature of the conflict in the Indian subcontinent, India faces a credible military challenge from China and Pakistan, along with its North Eastern and Western border respectively. Although the threat emanating from regional and transnational terrorist groups remains omnipresent, given the security doctrine, the Air Force has not fielded its assets in actual combat. It has restricted itself to a more non-combative supportive role. With this in mind, China and Pakistan continue to remain the current and potential adversaries against whom the IAF is likely to be called into service in the near future. Given the conventional military superiority enjoyed by India over Pakistan, both in terms of numbers and equipment, coupled with the lack of a "strategic depth" because of its geography, Pakistan continues to be at risk of an array of threats emanating from the Indian military forces. In terms of a limited conflict as witnessed in Kargil in 1999, conventional fighters have a proven record of attaining the assigned objectives. At the same time, the threat of escalation, which increases significantly with the deployment of air forces, remains an undesirable situation for both the countries given the nuclear arsenals of the two neighbors. Thinking purely in terms of an "all-out war" (which seems unlikely in the foreseeable future) Pakistani strategic assets, as well as major cities, remain within the range of India’s strike envelope. Keeping in mind Pakistan’s dense Air Defense (AD) network which has been geared to counter aerial threats in case of hostilities, India has developed and deployed a range of missile inventories including supersonic cruise missiles like BrahMos. With the latter having capabilities to be launched from land, sea, and the air version being in advanced stages of development, it serves as a system of choice for launching punitive strikes with surgical precision. Given these capabilities, enhanced range as well as the anti-AD capabilities, the need to fly into a hostile airspace can simply be ruled out. The latest case study of air and naval strikes in Syria by the U.S., U.K., and French using standoff missiles like the Tomahawk and Storm Shadow cruise missiles is a case in point. In the case of China, the possibility of extended hostilities remains even more remote than that of Pakistan given the robust diplomatic and strategic communication mechanism available between the two nations. In a worst-case scenario, the confrontation between the two is likely to be localized and into domains beyond the confines of the conventional battlefield. With the advent of unmanned combat aerial vehicles (UCAV) and given the nature of limited scope of a conventional military clash between India and its neighbors warranting the active use of the Air Force, the need of a manned stealth capable aerial platform holds limited utility at the moment. Moreover, the need to address the existing operational gulf and upgrading the current fleet, which remains adept at handling any contingency threatening the Indian airspace over the short-to-mid-term remains a more prudent choice.